As June comes to a close we are beginning to experience the true horror of the summer heat. These days in Dallas the temperature is consistently over one hundred degrees Fahrenheit, clouds are rare if not nonexistent, and the shriek of the cicadas is overwhelming and ever-present. It is truly a season to be despised. Each year I desperately search for something to help me ignore the boiling hellscape that the outdoors becomes, and last year I finally found my savior in Hollow Knight. Hollow Knight, if you didn’t know, is a 2D metroidvania developed by indie studio Team Cherry. Its notable achievements include above average difficulty, tight controls, an engaging story, and, above all else, an enveloping atmosphere. The simple art style and minimal color palette not only make the game’s visuals unique and appealing, but also help create one of the most comfortable games in history. 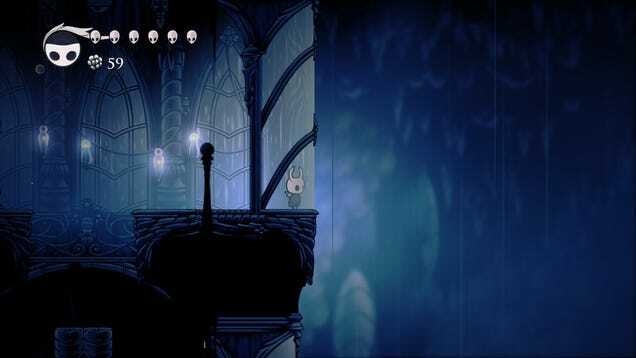 Every area in the fictional kingdom of Hallownest is dark and damp, only subtly illuminated by limited sources of light. You can almost feel the humid chill of the tunnels as you explore their expansive depths, as if the game’s atmosphere is heavy enough to spill out of the TV and into reality. The visuals definitely do their part in creating a cool environment, but the soundtrack takes it to another level. The background music for each environment is slow, mysterious, and inherently pleasant to the ear. The boss themes obviously have substantially more energy, but every other track exudes calm and comfort. My personal favorite is Greenpath, a song that invokes both a playful mystery and a subtle, reflective sorrow. These tunes alone are enough to cool me off and help me ignore my horrible sunburn. So the aesthetics will keep the malevolent sun out of your memory, but what about the story? This is where Hollow Knight ascends to the next level, cementing itself as the ultimate anti-summer game. The plot is a classic tale of dark versus light, but with the twist that the forces of darkness are the heroes. Light is a source of corruptive power, one so strong that it tore apart the entire kingdom of Hallownest. Darkness, originally intended as a vessel to contain the light, has to rise above its station and destroy the gleaming incandescence for good. This is my ultimate fantasy during summer: destroy the sun and all of the pain that it causes. Is this obsession disturbing and absurd? Maybe, but Hollow Knight provides an excellent catharsis for it. There may be no foolproof way to beat the summer heat. It will always be sickeningly hot this time of year, that is just something that I have to come to terms with. But with Hollow Knight by my side, at least I can do my best to escape to a world that isn’t quite so sweltering.